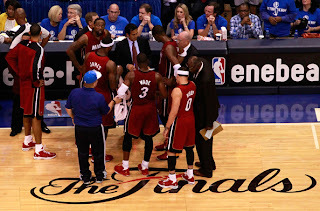 After watching the Dallas Mavericks take home their first-ever NBA Championship and also witnessing the media decapitate LeBron James and the Miami Heat in the process, I was trying to think of a way to make sense of everything that has happened over the last 13 days. And as I struggled to do this, I realized that trying to make sense of what happened concerning LeBron James, the Miami Heat, and the NBA Finals was like waking up in college the morning after a raging party and trying to piece the night together. You walk downstairs to see that someone re-arranged all the furniture in your living room, a 12-foot Christmas tree has suddenly appeared in your kitchen, and there's a blow-up doll sitting on your couch watching the home shopping network. In a similar vain, some of the things that happened during the NBA Finals left me scratching my head and trying to re-hash everything that's happened in an orderly column just wouldn't be possible. So instead, I present to you the only way I could recap what took place between the Heat and the Mavericks- a random collection of thoughts about the NBA Finals. 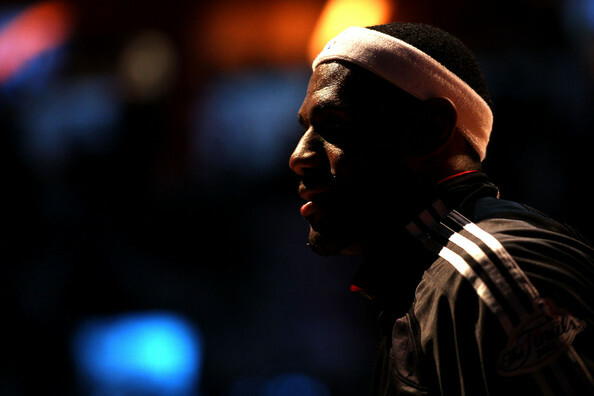 For whatever reason, everyone who even remotely cares about the NBA or LeBron James has begun to psychoanalyze the much maligned superstar after his most recent shortcomings on the NBA's biggest stage. There's no doubt that his lack of effort and miserable play during crunch time in the NBA Finals was downright maddening to everyone who loves the game of basketball and wants to see greatness realized. As an inquisitive species it is in our nature to try and search for the reason why the greatest basketball player in the NBA didn't come to play in some of the biggest games of his life and why he looked genuinely disinterested for long periods of time. But I for one will not be putting on my psychiatrist hat and trying to figure out what's behind LeBron's most recent postseason swoon. Maybe he wasn't hugged enough as a kid, maybe the pressure finally got to him, maybe Dallas is too humid for him, maybe he ate some bad Chinese food before game six. Whatever was going on with LeBron, the bottom line is that he didn't play well and the better team won the series. I would love to know what actually happened and why he was treating certain stretches of the NBA Finals like they were an early February game against the Nets, but I doubt we will ever know what's actually going on behind the scenes, if it's anything at all. The other side of the coin is that sometimes things that happen have no explanation and even the best players can have an off day. Digging around for some deeper meaning into LeBron's struggles is not only pointless but it also takes away from what the Mavericks accomplished. I agree, it's absolutely fascinating when one of the greatest players to ever play the game forgets to put his uniform on for a "do or die" game six, but I'll be leaving the postulating about LeBron's mental state to more qualified parties. I'm not making this statement about either teams ability on the court, but mentally, it was pretty clear to see that one team was much more experienced and mature than the other. Throughout the postseason, the Mavericks were all business. Dirk and the rest of the team were focused on winning a title and that was the only thing they were trying to accomplish. The didn't celebrate unnecessarily, they didn't fold under the pressure, and they didn't let outside forces affect what was happening on the court. 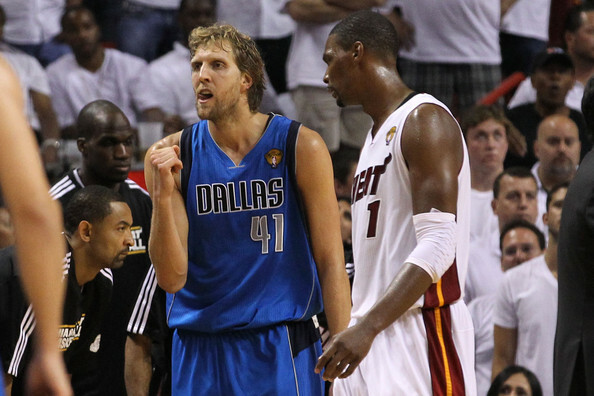 The Mavericks were the more focused and more mentally tough team, and it showed. They even got an assist from Mark Cuban, their often obnoxious but lovable owner, who was surprisingly quiet for some strange reason throughout the playoffs. Instead of complaining about the referees like those people you see at TGI Friday's who for some reason think they've just sat down at a five star restaurant, Cuban sat quietly and enjoyed his overcooked burger and soggy fries and he ended up hoisting the Larry O'Brien Trophy when all was said and done. On the other hand, the Miami Heat were all over the place and when they weren't celebrating like they had just won the title after beating the Celtics in the second round, blowing fourth quarter leads, missing late free throws, or turning the ball over, they were making fun of Dirk Nowitzki for being sick when they probably should have been thinking about how they were going to win a crucial game five. The Heat were the younger and more athletic team in this series but the Mavericks were the smarter, more focused, and more mature team. All of which helped them win the title. While basketball fans everywhere have been waiting for LeBron to become that dominant scorer who can put the ball in the basket a number of ways, it's become pretty obvious to me that he's the most versatile player we've seen in a long time but he's not going to excel in one specific area. You want 15 rebounds? LeBron can do that. You want 12 assists? LeBron can do that. You want a guy who will play lock down defense on the other teams best scorer? LeBron can do that. 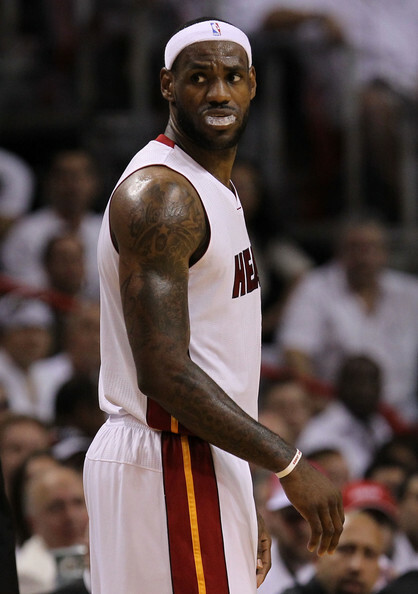 You want a player who is unstoppable when his jumper is on (like it was against Chicago in the ECF)? LeBron can do that. But what he has yet to do is perfect any single aspect of his game because he's so good at doing a little bit of everything. Everyone has been clamoring for LeBron to work on his post game because if he were to develop that, like Kobe and Jordan did later in their careers, he would be virtually impossible to stop regardless of how he was shooting or how other teams were defending him. A few years after the Celtics formed the original "big three" and won another championship for the city of Boston, the Heat did the same thing in the summer of 2010 and it looked as if more imitation big three's would soon follow. The thought of using free agency and trades to bring as many superstars to a single team as possible isn't a revolutionary idea, but it certainly has become the fashionable thing to do in professional basketball today. It's no secret that the NBA is a copycat league and if the Heat and Celtics are going to combine three immensely talented players through trades and free agency, why shouldn't everyone else who can afford to do so follow suit? Many have debated the merits of mashing together whichever three superstars you can get your hands on and hoping for the best, but it's certainly not the way that the NBA has traditionally operated in the past and both basketball purists and fans of small market teams around America weren't too thrilled about the new craze which seems to have swept the NBA off its feet. But on the heels of a deeper, more team oriented Dallas Mavericks team defeating the superstar trio of LeBron, Wade, and Bosh, maybe GM's and front offices around the league will take note. Judging by some of the decisions that certain GM's have been talked into and out of over the past few years, is it really so crazy to think that the Mavericks victory could open some eyes around the NBA? Obviously, you still need star power to win and without Dirk Nowitzki Dallas likely wouldn't have made it out of the first round, much less won the whole thing. But the Mavericks bench contributions and team chemistry were also huge reasons why they won the Western Conference and why they ultimately beat Miami. It seems unlikely that every team in the NBA will suddenly change their plans and start looking for more role players and guys who fit their system to compliment one or two superstars, but at least the Mavericks proved that in the face of the superstar team, there is another way to win. 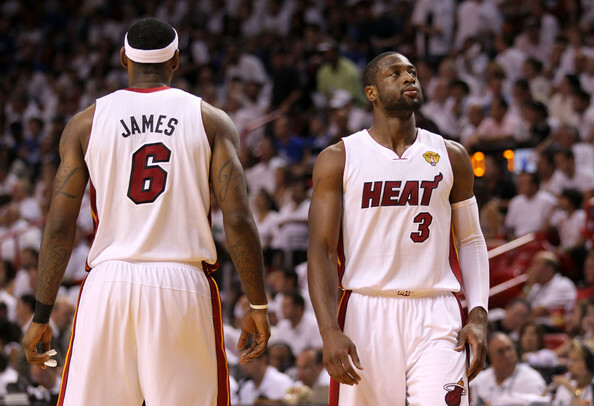 Many thought the Heat were simply going to dominate the NBA from the minute Wade, LeBron, and Bosh put on the same jersey. Just a few games into the regular season it was pretty clear that this wasn't going to happen and while Miami certainly battled through their share of growing pains, they still had a successful season. The Heat posted a 58-24 record, which was the third best in the NBA and earned them home court advantage in the Finals. 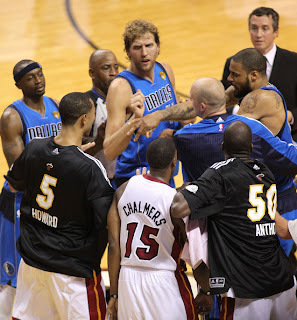 They beat the Bulls and Celtics to get out of the Eastern Conferece and although they came up short in somewhat embarrassing fashion against the Mavericks, this was their first crack at trying to win a title and they were just two games away from doing so. Anyone who thought this team was supposed to win a title in their first season was kidding themselves and those people put way too little stock on how important team chemistry and depth are to winning a championship. There's no doubt that some of the things that happened in the Finals will stick with this team for a while, but those who are talking about breaking up this team or that they will be scarred forever by what just happened should take a deep breath, have a cold beer, and relax. It's not the end of the world that this team lost to the Mavericks and it's not even the end of the world that LeBron didn't rise to the occasion on the biggest stage of his life. I'm certainly not saying that he played well when it mattered nor am I making excuses for him, but I'm simply saying that what happened isn't as big of a deal as we're making it out to be. After all, LeBron's only 26 years old and the core of this team still has at least four years together, so there's plenty of time. I'm amazed by people who say that LeBron won't ever win a title or that he doesn't have what it takes to win one, because if you're a great player in any major professional sport who has yet to win a championship after five or six years, this is the type of chatter that starts to become prevalent. To the media, anyone who is great and has failed on the biggest stage before is a choker and can't get the job done. Look at guys like Alex Rodriguez and Dirk Nowitzki, two great players who never won a championship until late in their careers. Immediately after they won their championships the book that had existed on them for basically their entire careers changed over night and they went from being guys who didn't have what it took to get it done, to guys who just needed some more time to perfect their games both mentally and physically to get it done. It didn't end the way they wanted it to, but their first season together was still a good one for the Miami Heat. I know it's practically blasphemous to say something bad about Dirk Nowitzki right now, especially after one of the greatest playoff runs we've seen in a long time. But I can't help thinking that the German seven-footer's place in history went from being underrated before the playoffs started to being a little overrated after he and the Mavericks took home their first title. Before the playoffs started, there were few people talking about Dirk as one of the 20 greatest players to ever play the game and what he accomplished over his incredible career was certainly overshadowed by more flashy players and somewhat overlooked because he had never won a title. 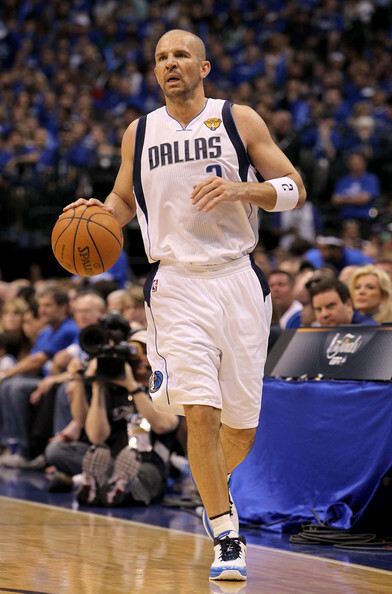 Of course, after leading Dallas to a championship, Dirk is getting some well deserved credit for the unbelievable player he is, but it seems to me that people are forgetting that Dirk hasn't always been the player he was during the 2011 postseason. I find it interesting that while much has been made about the fact that Dirk is such a different player today than he was for the majority of his career, many people are thinking about his place in history as though he's been this good all along. When he was a younger player, Dirk was content to shoot three-pointers, he didn't have much of a post game, and at times, he could be taken advantage of physically. This isn't to say that he wasn't an unbelievable player worthy of the Hall of Fame, but he wasn't 2011 NBA playoffs dominant his whole career. As he's matured and his game has continued to evolve, Nowitzki has toned down the three's, developed a deadly post game, and is now strong enough to hold his own against even the most physical defenders in the NBA. The entire league saw just how impossible Dirk is to defend after changing these aspects of his game, but these are relatively new developments. There's little doubt that Dirk is one of the greatest players to ever play the game, but let's all remember that if he had been this good for his entire career, this wouldn't have been his or the Mavericks first title. That being said, if Nowitzki and the Mavericks do this again next season, I'll have to reconsider my position. I'm not going to say that this was a completely neglected, but there have definitely been plenty of other less interesting and less important stories that have gotten much more play than one of the greatest point guards in NBA history winning his first title. At 38 years old, Jason Kidd isn't the player he once was (then again who is at 38?) 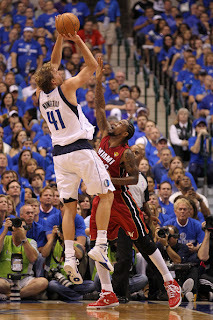 but he was still a huge part of this Mavericks team throughout the regular season as well as during the playoffs. Kidd's playmaking, defense, clutch shooting, and leadership were all huge aspects of the Mavericks title run and they certainly couldn't have done it without him. The best part about Kidd getting his first ring is that he's been to the Finals twice before only to get steamrolled by the Kobe and Shaq Lakers in 2002 and then he fell to the Duncan led Spurs in 2003. For a player who has been thwarted in the Finals by two of the more dominant teams of the past decade, it was certainly a sweet victory to see him defeat a team that has the potential to be the next dominant team of this current decade.